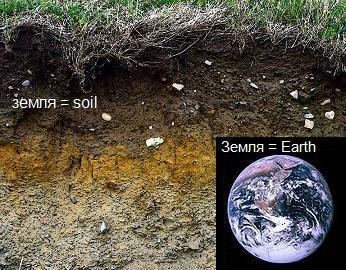 A collage showing soil and the planet Earth. These two words are pronounced the same in Russian. There is dry soil in the pot. Мой сэ́ндвич упа́л на зе́млю. My sandwich fell to the ground. The earth has cracked from the heat. Моряки́ уви́дели зе́млю на горизо́нте. The sailors saw land on the horizon. Родни́к бьёт из под земли́. The spring gushes up out of the ground. Я роди́лся и вы́рос на ру́сской земле́. I was born and grew up on Russian soil. Де́вушка поста́вила чемода́н на зе́млю. A girl put the suitcase on the ground. Диноза́вры исче́зли с лица́ земли́. Dinosaurs disappeared from the face of the earth. Во́здух па́хнет землёй и молодо́й траво́й. The air smells like soil and new grass. Bad is sower, not the land. The world is large enough. ; There are plenty of fish in the sea. Not a trace of smb. literal The earth gets filled with rumor.